Apple Tablet naysayers: get your heads around the idea it’s not a new form of PC, but another and superior way of interacting with data. On the eve of the Apple special event, and considerably more information dribbling out from sources that we are looking at a tablet-format device, spare a moment for those naysayers asking why the world “needs” another tablet, when the models before (powered by flavours of Windows) have all but failed to make an impact, except for very highly specialised fields, such as medicine and logistics. Others of a more erudite nature are asking what solution the tablet is seeking to address, which is a reasonable question to ask of any technology. But they forget the history of technologies in human development, as I usually elaborate upon in my workshops on Technologies and Society. (I am often asked by professional colleagues to address fellow psychologists who wish to be updated on technology trends and how to better incorporate changes into their practices. I always start by giving a potted history of mankind’s relationship with technology). Technologies like the tablet always bring a curious mixture of hope, doubt, powerlessness, and empowerment to those who spend time considering how a new technology might impact them. Change, not of your own decision-making, is hard. IT departments in large enterprises know that about 50% of IT projects fail in their implementation, either because it was the wrong solution for the estimated problem, there are cost overruns, loss of significant project personnel at a critical time sees the project delayed, there is political interference should a merger take place simultaneously, and finally, the end user – the data entry staff – reject the new technology because it is a poor match for what they do, they are so accustomed to how to do things, or their training has been poorly managed. But like most things Apple, this new device is not aimed at taking over the enterprise market place. I’m sure Apple is very content to leave that to the likes of Microsoft and Oracle for instance. Big profits, but big headaches too, with Windows Vista being a good example of the latter, and not the former. In these introductory minutes I spend with workshop groups, I attest to how technologies have been used down the ages: as tools to enable, extend, augment, and connect humans and their innate abilities. The best technologies, those that have the most impact for the most people, do all four. These technologies often leave previous technologies that bear a faint resemblance to their purpose, as archival pieces, to be studied in history class, or to be repurposed. Those who believe the tablet will be just another computer but in a different, but hitherto unsuccessful physical form, and thus doomed to failure, are dooming themselves to repeat history: that of misunderstanding how technology progresses, and in particular how Apple conceives of technology and its place in human-computer interaction. You only need to recall the negativity when rumours of an Apple cell phone began in earnest in 2006: “.. the market is too mature for an outsider like Apple to enter” was the gist of one type of message heard. “What does Apple know about making phones…?” was another, utterly forgetting that Apple is a hardware company as well as a software developer. Given the “maturity” of the cellphone market, meaning the stuff that makes them operate was now so ubiquitous and cheap that the cost of entry to the cellphone market was not the issue – it was how to differentiate oneself from the usual suspects. And this is where Apple’s design superiority and integration caught the senior citizens of telephony flatfooted, locked as they were into seeing hardware as the differentiator (how many models does Nokia have at any one time – dozens if not scores. Makes choosing just the right one easy, right? Wrong! ), rather than software. Apple saw that universal access to the internet (web, email, file sharing etc) was the next bold step for a portable device to take, and its mobile Safari browser was at the time the best reproduction of a desktop browser available, compared to the poor excuse for internet connectivity of other phones. Witness such new endeavours as SquareUp, (left) with its e-commerce abilities, and hardware addons. Or in the medical field, what a company called AirStrip Technologies is doing with the iPhone. It’s true other technology companies often enter a field earlier than Apple, but too often their technologies are too big, too unreliable and too clumsy to use other than for specialist needs and where there is very limited competition. And thus also too expensive to break out of the enterprise and into the consumer world. Apple takes the reverse path, designing for the masses (yes, those in the mass who can afford and appreciate well-designed and built equipment). Later, those early adopters bring it (e.g., the iPhone) into the enterprise, where IT staff are made to kick and scream in protest that it’s all too much and their expertise – and importance – is being challenged by those who don’t understand the role of enterprise level IT. Go here to read what I’m sure has to be a tongue in cheek apocalyptic blog entry from an IT specialist). So, the lesson is that Apple releases groundbreaking devices that change how we both think about and interact with digital technologies, usually in fields already explored but not exploited by other companies, and does it in a compelling fashion not for IT geeks, but for those who want something better than “good enough“. When the tablet is unveiled, you’ll see a combination of gasps and disappointments. Some will immediately see the road ahead, especially developers who can see how to extend their product line and reach new audiences, and who have learnt from the iPhone’s introduction to look beyond the initial release product and roadmap. And the disappointment will be from those who expected some miracle device in a version 1.0 product without understanding how Apple operates. They’ll stick as long as they can with their Kindles, looking for reasons why its one pony show is a great solution for that problem; or they’ll stay with a Windows 7 powered tablet so they can exercise their minds with Microsoft Office in a tablet format, as if somehow that’s better than a desktop or netbook or laptop solution. But for those who gasp, who get what Apple’s doing yet again with familiar but newly thought through technologies, they will be very anxious to change how they conduct their lives on a day to day basis, for the better. Who will join Steve Jobs on stage next week? A few educated guesses… perhaps Rupert himself? I was having lunch last Friday with the guys at Connecting Point, a Melbourne Apple reseller with a large customer roll within the educational sector, from primary (elementary) through to college (university). It also makes sales to individuals, and I have referred a number of switchers to them over the last year or so. I was booked to see Avatar for the second time at the iMax cinema not far from the Connecting Point Friday lunch get together, last week including an Apple engineer, so dropped in to discuss my preparation for Macworld, and of course rumours over the tablet. I jokingly offered that joining Steve Jobs on stage would be none other than Rupert Murdoch, whose parent company News Corp. has multiple media interests ranging from Fox Studios, through to the Wall Street Journal, and publishing houses such as HarperCollins. Rupert, known in his Aussie homeland and especially the UK as “the dirty digger” for his union busting activities, has been outspoken about how users must eventually pay for quality journalism, even though critics of his publications such as the New York Post and the Fox cable network might question the meaning of “quality” in this context. But Murdoch now owns the Wall Street Journal which in recent years has obtained accurate leaks of forthcoming Apple products, so we can assume that News Corp. and Apple may well have reached a deal, even if Murdoch and Jobs’ politics diverge considerably. Both are huge business risk takers and surround themselves with highly competent and trusted senior executives. Both share a love and passion for how their respective products and services are world-changers, and so there is a business synergy between the two. Whether they would share a stage together to make a compelling announcement is up for grabs, but I fully expect a News Corp (or one of subsidiaries) rep. to be up on stage at some point on January 27. If it is Murdoch or a senior News Corp. exec., it will cause other publishers to sit up and really pay attention to what Apple’s doing in the publishing world. I should also note the long term connection between Murdoch and Prince Alwaleed Bin Talal, from the Saudi Royal family, who has major media interests in the Middle East and who is also a long time significant Apple shareholder. No doubt, Phil Schiller will play some role as Senior VP of Worldwide Marketing on stage, demonstrating some Knowledge Navigator-type of function of the tablet. We’ve already seen Jobs and Schiller do something like this when showing new competencies of iWork 09, as well as a three-way conversation when Jobs introduced the iPhone in 2007. I don’t expect Phil to do a demo on his own as he has done in the past with desktop Macs (do you remember Photoshop bakeoffs comparing Macs to Dells in previous Macworld keynotes?). If the tablet includes a webcam (perhaps using the screen itself as the camera, based on patents going back several years), then perhaps we will see a video conference with Phil take place. Scott Forstall, Senior VP of iPhone development will get the stage to himself to demonstrate the next iPhone software, version 4.0, especially if this is also what powers the tablet. If it doesn’t, then Bertrand Serlet, Senior VP of Software Engineering may do the duties. At an outside chance, they may share some time on stage demonstrating how iPhone 4.0 can allow OS X apps like iWork/iLife to be modded to work on the tablet and sync with your Macbook or iMac. And of course speak of the roadmap for iPhone 4.0 developers and when they can expect to get their new software underway. I don’t predict we will see Jonathan Ive live on stage, but he will be featured in a lengthy promotional video discussing in his passionate way the design philosophy of the tablet, plus the engineering challenges Apple spent years overcoming, which will leave its competitors dumbfounded in their efforts to match the Apple solutions Ive and his design team have developed. In the same video, I would expect to see interviews with other Apple senior engineers, well known within the company but without the fame the others mentioned so far have garnered over the years. Naturally the same video will also include providers of third party services discussing the impact the tablet will have on their business and how Apple offered them unique solutions no one else had the foresight to conceive. And we’ll say video of famous faces being “amazed” at what the tablet can perform. Up on stage again, I am fully expecting a New York Times senior staffer or family owner to meet and greet Steve, then discuss how the NYT sees the tablet as the right step forward for its pay-per-download subscription model, something it tried and failed with previously for its elite content, such as Maureen Dowd and Paul Krugman’s columns. From there, it will be time for the select few app. developers to show their wares, including how their current apps can be resized, but also how they’ve developed new apps especially to take advantage of the tablet’s special features. I’d include here comic developers for whom the tablet seems an ideal platform to reach new audiences. Also expect one or two major gaming production studios to present, then some highly specialised domains to show how they intend to use the tablet. Something medical is a certainty, whether it be a hospital staffer showing new imaging software, Johnson and Johnson once more showing blood pressure or glucose measuring addons, or a less well known but highly innovative specialist company showing how the tablet has a place in the hospital setting, say in radiology. Clearly, those who will team with Apple to place the tablet into its own niche, and own it. Perhaps it will be a 3G cellphone CEO (but which one? ), a major recording industry partner, or a rep. from Disney who will demo the downloading on demand of its products using a new version of iTunes, which Jobs himself will give a more full featured demo for when showing how the tablet integrates with other domestic appliances, including AppleTV and perhaps other set top devices. 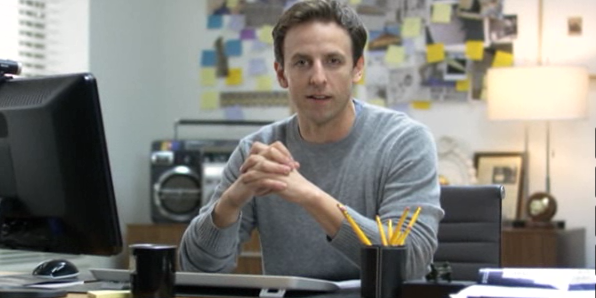 And then there’s one more thing… I can’t even speculate on this, and frankly don’t want to. Like most others who follow Apple closely, I enjoy being delighted by surprises even after I spend time tracking Apple’s history which allows for the guesswork I’ve made in today’s post. Like most predictions about Apple, there will be many who will see the tablet as a weak solution to a non-problem, just as many predicted after the iPod’s release in 2001 that it was a brick going nowhere, or that Apple would fail with its iPhone because that technological domain was already mature. What these soothsayers focussed on was the hardware, not the ecosystem that is Apple’s ownership of the entire widget, starting with its ability to harness its software prowess. With the tablet, Apple will enter into new fields of publishing with new partners, where once again the hardware is a mere conduit to content which is either too expensive or hard to access (I’m thinking here of specialised journals and literature), as well as new twists on familiar domains such as music and video, which a much larger screen with new user interface will leave us entranced. As Jeff Goldblum famously said in the first advertisement for the titanium Powerbook G4 in 2001, “you’re gonna so want one”. Newsflash: Microsoft announces Powerpoint 2010 will be able to run two videos on the one slide at the same time! (Yawn) Watch this demo I made in 2006 with Keynote 3 running nine (yes, nine) videos simultaneously, without dropping a frame. Because Powerpoint 2010 will take advantage of hardware acceleration and DirectX9.0, you no longer need to use auxiliary software like Windows Media Player to play videos on a slide. If you’re a Apple Keynote user, you’ll know that since it was released in 2003, seven years ago, it’s had superb video handling capabilities even on old G4 Powerbooks. It’s because Steve Jobs wanted it to have “cinematic” properties, in addition to very fine text rendering. In 2006, shortly after Keynote 3 was released, and when Powerpoint 2003 was still the current version, I created a Keynote slide for a presentation I was giving to challenge Powerpoint’s dominance of the presentation market place. I was particularly enamoured of Keynote’s video handling abilities while Powerpoint struggled with it, keeping its users from truly becoming creative and keeping them to awfully pixelated images and multi-step complicated management of video placement on slides (as the Powerpoint blog states above). The video below is one I created today using that old 2006 Keynote 3 slide, playing in Keynote 5 on my MacBook Pro (2008). As I explain, you’ll see nine videos with sound playing simultaneously, all on the one slide, all timed to come in one after the other automatically. The video is a little on the dark side because I’m using a data projector to show the Keynote slide, while simultaneously using the Macbook Pro’s built-in iSight camera to create a Quicktime Pro movie (actually an mp4). So the poor Macbook’s doing double time! So while the Powerpoint crowd can whoop it up today (and it really is an important change for that crowd and hopefully means we’ll see more creativity emerge from the average user), those in the Keynote community will be looking forward to update announcements for Keynote to be made very soon, truly making it the presentation software of choice for those who value creativity in their presenting. With the extra spare time due to the summer break here in Australia (things get busy again next week), I have been experiencing a “Perfect Storm” of blogging: Intense interest in things electronic via CES 2010 (now history), the headiness of a major Apple product revolution that even has sceptics agreeing something big this way cometh January 27, and of course thinking and preparing for my Macworld trip in a month’s time. It will be an intense two weeks away, with several days at Macworld for a Presentation Magic Powertools workshop the second week of February, a folk dance camp in Palm Spring immediately after (where TEDActive is also occurring), then a Presentation Magic seminar for the Psych Department at USC, back to San Francisco for a visit to Apple for a presentation the day after, then a three day conference in San Francisco on Smarter Brains and Improving IQ. I’ll also be leaving on the first anniversary of catastrophic bushfires in my state where 170 people died, and for which a Royal Commission is being held into how the disaster was managed. I was involved as a Personal Team Leader for the Australian Red Cross working in the days and weeks after with victims and survivors of the fires, as well as trying to match reports of missing people with those who had made the reports, to see if there were people still missing. With last night being the hottest on record (36C) there are fires again today in the State. If I can pull all these activities together into a theme, it’s one of diversity and continuing learning experiences, where I take what I have learnt in the past, and place myself in a position of “not knowing” yet finding ways of applying my knowledge in new situations with new populations. I remember working in a Red Cross welfare centre 150km from Melbourne not far from the fires where people would gather to seek safety, food, shelter, and clothing, as well as seek out their neighbours, friends and family who had “gone missing”. In addition to comforting them, my task was to supervise other workers to take down details of the people attending and those being reported missing. We were setting up lists that were then faxed to Red Cross headquarters in Melbourne where 24/7 workers sitting in front of PCs would enter the faxed data sheets into a database, so that if people turned up at my or other rescue centres, they could be crossed off the list of being safe, and added to lists of those who might need follow-up for both material and psychological aid. As I think about it (I’ve been invited to attend a further training session in preparation for anniversary effects) I’m left wondering how a 3G/Wifi Apple tablet could have helped us out, taking pictures of those who attended, using face matching as we can in iPhoto to match up with pictures of those presumed missing, and directly placing survivor details into the database. I’m fairly sure hours went by when PC operators were swamped with faxes. If I think now about the training I expect to offer at Macworld, the task will be to offer a theory of presenting based on cognitive and affective neuroscience, basic design principles, commonly seen effects for text and visuals in the movies, on television and on the web as models for driving Apple’s Keynote, and of course, exploring Keynote’s functions and operations in order to achieve the best exposition of my theories of presenting. I’ll also be referring to various texts which I’ll also be giving away as prizes (I think everyone enrolled will probably get one book!). One will look at iWork 09, and give a section by section breakdown of Keynote’s features, while others will offer considerations of design principles including slide makeovers, as well as examples of good presentation technique. For that, I’ll also use my own and TED videos for the good to excellent and downloaded Powerpoints for the bad to really horrible. If I think abut the books, they are all good in their respective endeavours of enlightening readers. But by necessity, they are static examples of what is really a dynamic human activity. Moreover, as much as reading about, or seeing screenshots of Keynote’s Inspector or font menu is useful, it can’t really compare with watching someone take you step by step through the process of using Keynote’s facilities, then seeing the interim, then end product. 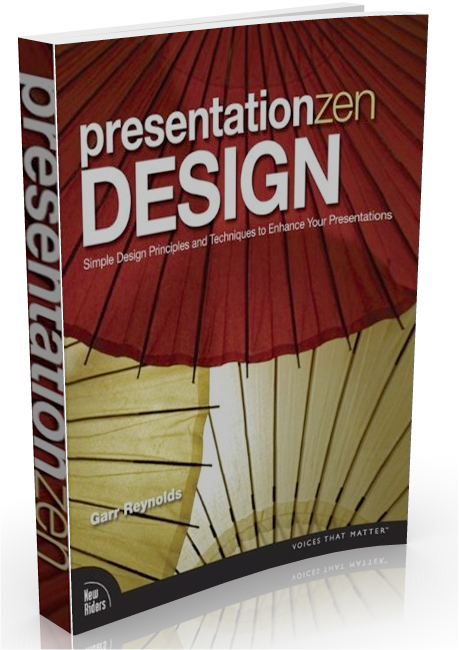 To my knowledge, there is no book yet on the market that really tells you how to use something like Keynote and think about how to use design principles such as Garr Reynold’s new book contains (Garr is giving me some of his books as prizes of course!) Garr’s book like many others tries to be platform-agnostic and thus broaden readership. Powerpoint keeps improving but as long as its major settings for its use are academia, the military and the enterprise, Garr’s book could be included with the next version (due for release in June) but improvements in presenting with Powerpoint would still happen very slowly. (Previous criticisms of Garr’s approach with respect to scientific data has been addressed, and I certainly give this aspect close attention in all my workshops). In fact, given the nature of the subject, can a book accomplish these two tasks? Can a book help you choose an animation, or build or transition for your particular subject matter and let you see the various effects possible. I know of this difficulty given each time Steve Jobs presents at an Apple keynote, I (and others) watch very closely for any new Keynote effects and designs. When I spot them, I can’t show a video on my blog for copyright reasons, but I can show screenshots of the builds or transitions in action. Not a very satisfactory method, but it’s the only way to show the new effects until I get my hands on the update and can use it myself. So if one of the functions of the tablet will be to deliver reading material, as many have suggested will be the case, why not show how to use Keynote’s feature set while describing why one is creating certain effects. I already do a little of this on this blog, uploading screencasts of my Keynote files to YouTube for display here. It’s clumsy however, requiring a fair amount of effort for a few minutes. Not that I’m against that of course, if you’ve been reading this blog, since I know how much effort is required for great presentations. But we’re talking here of cutting down on multiple clicks, a centrepiece of Apple functioning. I’d like the tablet to enable me to use a tabletised iWork to help me create a book form of my Presentation Magic workshop, Pages for assembling the text and layout and Keynote for demonstration purposes. Hopefully, the tablet will have some way of recording screen activity, much like the iPhone allows for static screenshots. Then I can assemble my book, with my text in place, my demoes including how I setup each slide, and what the final output will look and sound like. I can include hotlinks to sites like iStockphoto for photos and movies, and other sites for audio files, as well as newspapers and journals for headlines and abstracts I wish to show. 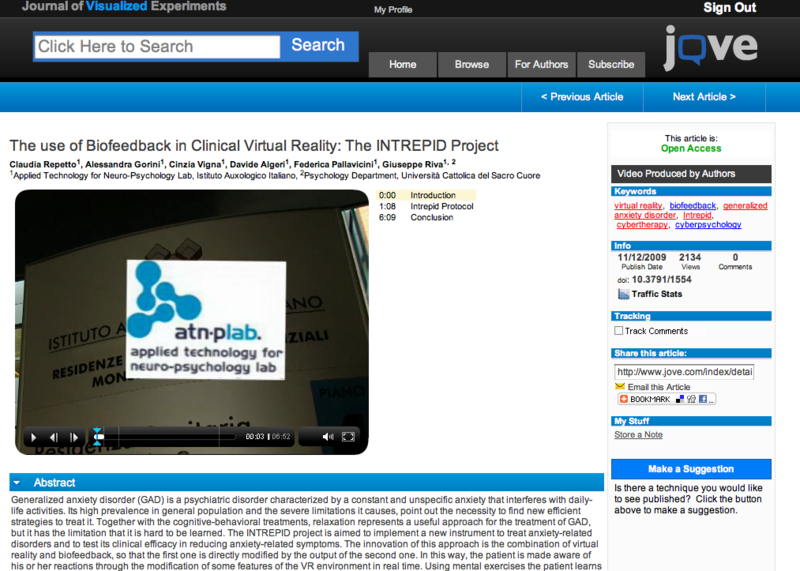 The idea of using videos to demonstrate science journal writing already exists in the Journal of Visualised Experiments which shows viewers how the experimenters performed their tasks, the equipment and questionnaires they used, and the interpretation of the data. Take a look at this publication about using biofeedback in working with anxiety (screenshot below). I’m going to guess the first of “augmented book” you’ll see, hear and read on the Apple tablet will be Apple’s own tablet manual, guiding you through a hands-on demonstration of its wares, with videod commentary and feedback about how you’re doing. This will be terribly important if the tablet does in fact include something of a learning curve for a new interface. It kind of reminds me of the first few days I spent with my first Mac, a Mac Plus in 1990. I used the included floppy discs which taught you mouse functions, like clicking and dragging, as well as how to resize windows and use the drop-down menus. I vividly remember having dreams of mousing around with the Mac and then spending hours the next day practising how to manage this new interface, so different was it from my previous experiences, using mainframes, PDP-11s and Tandy TRS-80s. I’m going to guess it will be the same twenty years later, such will be the change in input method. I can hardly wait this time however to write my own tabletised book complete with Keynote demoes. No more need to include CD or DVD samplers in the backs of books to demo what your chapters are trying to illustrate with words and static pictures. Over the weekend, I noticed almost a dozen application updates waiting for me in the iTunes App store for my iPhone 3G. 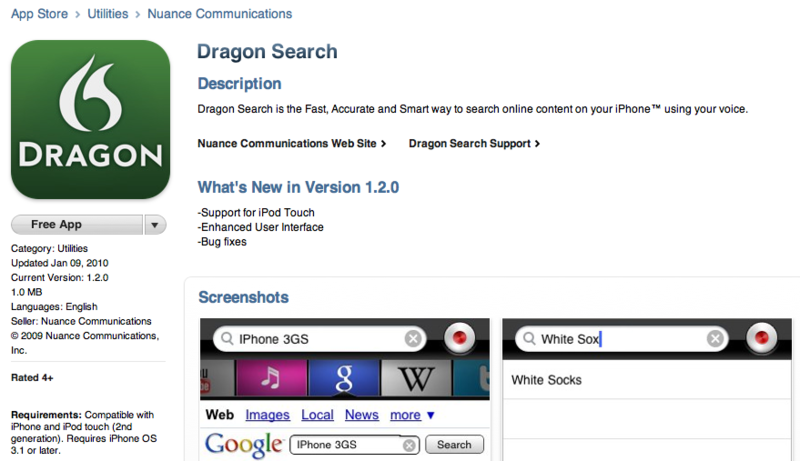 The two key improvement cited for both were: Support for the iPod Touch, and Enhanced user interface. Let’s connect some dots. Imagining the the Apple tablet runs a version of the iPod OS (4.0 or a modified version), what’s to say that Dragon’s highly rated and free apps can’t be scaled for use in a tablet form factor. So along with a revolutionary user interface (I am listening to Steve Jobs in my head using the same words he employed at the iPhone release three years ago), might there be an optional voice-controlled dictation and search function from Dragon? And extend it a little further, and have Dragon’s software also control operating the tablet (“Open Mail; new entry…”) something I can already do with MacSpeech Dictate for my Macbook Pro, along with a bluetooth headset which does double time linked to MacSpeech, and my iPhone currently (but not simultaneously). 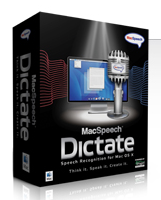 Macspeech is based on Dragon’s Naturally Speaking engine, well established in the Windows world. I’ve been using it with the Plantronics Bluetooth headset and it’s very accurate out of the box. The question would be whether a built-in microphone would be up to the job, or if you’d have to don a headset to perform all the functions. But if the iPhone’s built-in microphone can do the job well enough (the Dragon iPhone/iPod software gets very high ratings) then perhaps that problem has already been solved. Also remember that Apple has a dedicated speech recognition and synthesis research lab which has had input into Macs for a decade as well as the iPhone since its release, and you have a few more dots to connect. It doesn’t have t be necessarily an either/or case for the tablet. Why not have both forms of input, touch and voice) as you can now for any Mac. Speech recognition will have huge benefits for certain professions, such as the health sciences, for those who cannot use keyboards or complicated finger-based controls, the commercial aviation industry who could bring up all their Jeppeson maps, and of course students from late elementary school through to graduate school (where texts and lectures will already be carried on the tablet). Keeps getting more interesting, isn’t it…? Will an Apple tablet with iWork help bring on the end of Windows for the average user? You know those often quoted statistics that Windows powers 90% of the world’s computers, or that 30,000,000 Powerpoints are given each day? Do you ever wonder where these numbers come from? Me too. The latter appears to come from Microsoft itself. Given my own made up statistic that 95% of them disobey most evidence-based rules for conveying engaging memorable messages, I have a lot of work ahead of me to offer up alternatives! But what of the percentage of computers figures? It depends on which computers and who’s using them. It’s perhaps an apocryphal story of the Microsoft spokeswoman addressing a group of professional moviemakers touting certain wares. Allegedly she said in passing, “Of course, Windows operates on 95% of computers”. To which one wag replied, “Not in this room, lady”. What then should we do with the figures we see quoted the last few Steve Jobs keynotes that 50% of Apple store purchasers of Macs are switchers, presumably from Windows. Not new computer users, nor Apple users updating, but switchers. What will be the impact of an Apple tablet on potential switchers, I wonder? If an Apple tablet is a glorified Kindle, the answer is nothing. But what if Apple has developed a new device, one much more attuned to the needs of a public who is not concerned with operating systems, Tuesday patches, malware, spyware, trojans and viruses? What if the vast number of general public users just want to work with email, surf the net, chat and social network, watch movies and listen to music? Leave it to the vast bulk of that purported 95% to run Windows on a desktop machine: airlines, banks, enterprise, universities and various research institutes. But what of Mom and Pop, their kids, the self-employed, SMEs? Let’s also imagine that’s it’s a device that runs iPhone 4.0, to take advantage of some of the 120,000 apps. Apple has in its iTunes Store. Some of those will be reader apps, but I’m betting Steve Jobs will do to publishing what he’s done with music and movies: allow his hardware and software to be portals for purchasing. I don’t buy the idea that all publications will have their own apps. And I’m betting that with Pages we’ll all be able to engage in self-publishing, and I am breathless with what will happen with Apple’s presentation software, Keynote. If it turns out this way, we’ll have a device which will surprise and delight Windows users who will no longer have to fear opening their email, wonder if they have the latest drivers, or wonder which tech support system to ring – the hardware make, the graphics chip maker, Microsoft, the application creator, like Adobe, or the printer manufacturer. What will happen to the world of computing when the operating system is of no great consequence? We no longer call it computing, that’s what. We no longer think of buying a PC. Computers will be those large mainframes spitting out airline timetables and tickets, crunching large databases, just like it was before the personal computer came along. Talk about back to the future! The rest of us will be making the transfer from laptops and desktops, learning a new way of interacting with our information, and wondering how we ever were so short-sighted as to think personal computing was all about the operating system. 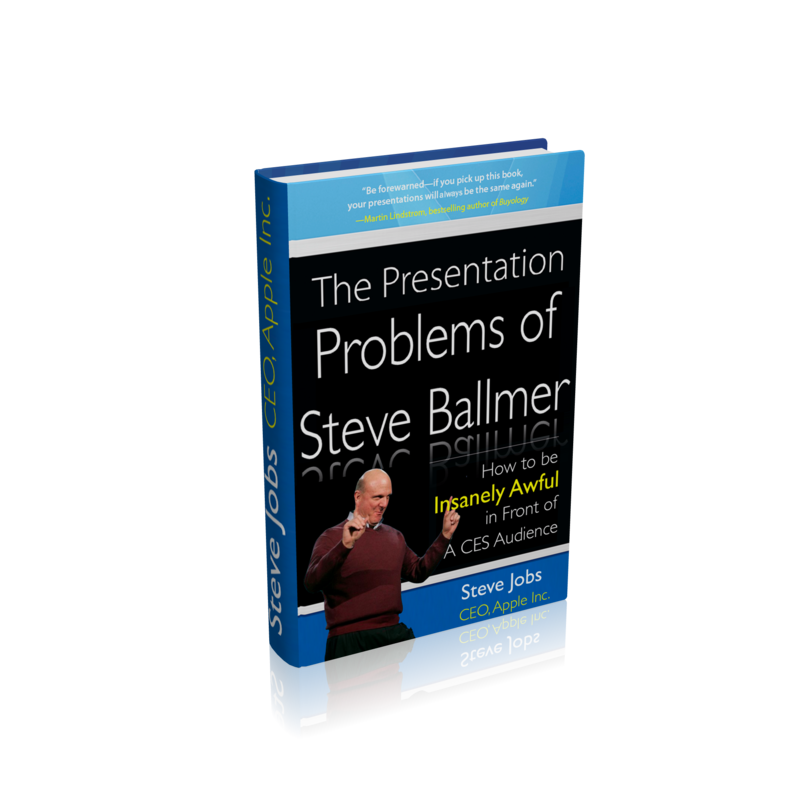 Steve Jobs to Steve Ballmer: So you think you can do a Keynote? About a tablet? Here, read this book I’ve written just for you. Did you catch the CES keynote delivered by Microsoft CEO, Steve Ballmer during the week? In the last few years, Microsoft has been the kick-off keynote at CES, with many looking forward to see what it has to offer for the year to come. Bill Gates of course did several of them, and the world’s richest man was always a drawcard. He was not a great speaker, and his slides were not what you could call inspired, as I have described on a blog entry from a few years ago. (At TED recently, he has obviously been coached in terms of slide design and presentation skill). When Steve Ballmer took the reins as CEO, he too became the first keynoter at CES, showcasing Microsoft’s wares in terms of software and hardware, usually giving time and space to OEM partners like Hewlett-Packard. This year was no different, and rumours that Ballmer might show a much-rumoured tablet called “Courier” raised temperatures a little, even if they didn’t reach the fever-pitch Apple’s alleged tablet created. 1. Will Steve Jobs be the primary speaker (and how will his health appear)? 2. What new products will be shown? 3. Will these products be updates to existing ones, or will Apple introduce a new genre, taking something familiar and turning it on its head? And when will they become available? 4. Will Steve Jobs perform his keynote using an updated version of Apple’s presentation software, Keynote? 5. Will it be confirmed, yet again, that he is one of the world’s great presenters and speakers, worthy of emulation? 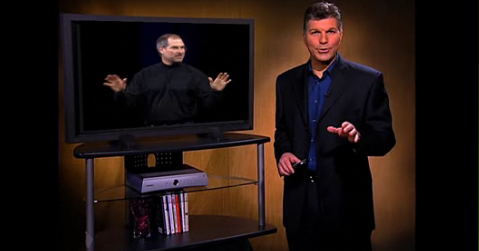 Steve Jobs regularly makes lists of admired presenters, with many attempting to emulate his style, often not successfully. 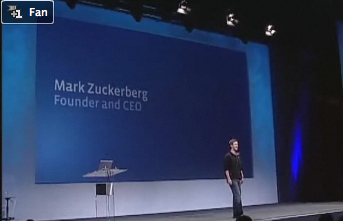 Probably the worst attempt to “channel” Jobs was Facebook’s Mark Zuckerberg’s 2007 F8 performance. His performance was contrived and stilted, leaving those who had been comparing him to Steve Jobs at the same age a little embarrassed. He’s a smart cookie, but somewhat shy which shows in his presentations and interviews. Search YouTube for his many interviews. One person who has taken more than a passing glance at Jobs’ presentation style as one to emulate is California-based Carmine Gallo, who maintains a BusinessWeek blog here. Last year, he wrote a very popular column which then became a best selling book deconstructing Jobs’ presentation skills. Here’s the book cover for Carmine’s publication, which he has kindly allowed me to offer as a prize during my Presentation Magic workshop at Macworld next month. While many including myself have discussed Jobs’ presentations, Carmine’s is the first in book form, and which allows him to personalise, through Jobs, his own long-considered thoughts on how CEOs in particular ought to present ideas, concepts, services and products. It’s hard to put a value on how much these presentations add to the acceptance at first blush of Apple’s product announcements, but it should be added that not all Apple Keynotes showing new products see Apple’s share price rise. Quite often they fall, due to the extraordinary hype and expectations leading up to the keynote, and the disappointment sometimes experienced by financial commentators. This past week, this fall occurred to both Microsoft and Hewlett-Packard after Steve Ballmer took the CES stage and showed an H-P tablet powered by Windows 7. In the months prior to CES, the rumour mill had struck up a conversation about the “Courier” tablet. Take a look at this supposed leak reported by Gizmodo here. Long time observers of Microsoft have become very aware of its capacity to hype “vapourware”, but there had been high hopes that Steve Ballmer would discuss Courier, what with an Apple tablet seemingly on its way. When a regular H-P tablet running Windows 7 was displayed, the disappointment was palpable, and widely reported in mainstream media and unforgiving blogs. But there is more to it than the product. There is something about how Ballmer presented at CES that draws a comparison to Jobs, for those interested in presentation skills. 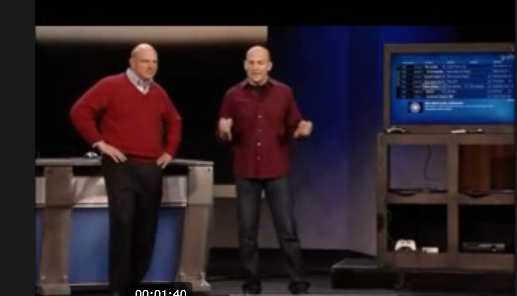 There are also numerous CES 2009 Microsoft keynotes with Ballmer you can view on YouTube so that you don’t think 2010 is the exception, because it’s not. 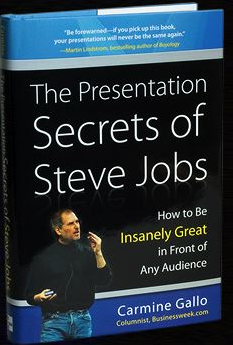 But if we keep ourselves to the keynote just past, there are a number of contrasts with Steve Jobs to offer, some of which might help readers with their own presentations. 1. Despite his avuncular appearance, Ballmer is more Phil Schiller than Steve Jobs. Which means his overt cudliness doesn’t translate into emotional warmth. As with Schiller, (I have attended a Schiller and a Jobs Macworld Expo keynote, but not a Ballmer one) I feel like he’s talking, even shouting, at me. Despite what has been written about his interpersonal style one-on-one, Jobs’ on stage persona exudes warmth, approachability, and yes, friendliness. You feel he’s holding a conversation with you, even when he’s in front of a 5,000-strong audience. 2. On stage, Ballmer reminds us that “once a salesman, always a salesman”. Both Jobs and Ballmer talk up their companies’ financial success in the year just gone, but Jobs chooses to illustrate his review, while Ballmer just tells me. But more conspicuously while both overuse hyperbole – “it’s perfect vs. we couldn’t be happy” – I never lose sight I’m in the presence of a salesman with Ballmer. That’s fine for some audiences, especially inhouse, but when you’re being broadcast to millions around the world, you need more than being a “Mad Man”, you need to convey a vision for the future, where these products will take me. Perhaps because the tablets and devices (other than gaming) he was showing were made by others, powered by MS software, there was limited ownership of what the product was going to do for me. With Jobs, whose Apple owns the whole widget, you get the feeling the company has thought through a vision for their technologies and how they will be used. These aren’t Ballmer faults per se, but for a CES keynote you want more than just a few warmed over products (as they have been described) to excite the masses. 3. Ballmer tells no stories, just sales pitches. It’s the proverbial solution in search of a problem. As Gallo points out, when Jobs introduced the iPhone, when many had said Apple should stick to computers and not enter “a mature” technology domain of mobile telephony, Jobs set up the usual suspects (Nokia, Sony, Motorola etc) as antagonists, then brought in the iPhone as a hero who would save us from complicated, incomplete and limited solution devices. He offered a solution to a problem we didn’t know we had, a mantra for Apple if ever I heard one. But then he picks it up, holds it in front of his tummy so he has to bend his bald pate down to see what he’s doing upside down, and fumbles the demo. How hard would it be to hold it out in space, let us see its form factor (remember how Jobs demoed the MacBook Air?) and operate it away from his body in its own space? Or move himself to a lounge chair and simulate how an end user might work with it (it’d look warm too), while a camera on stage offered close ups. This was a big mistake, and suggests a combination of lack of rehearsal and feedback from others. 5. 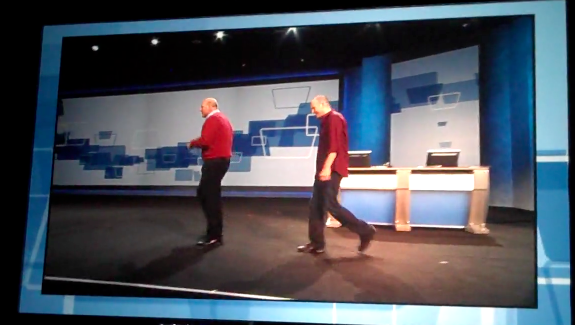 There are some awkward moments on stage when Ballmer is joined by a colleague doing another demo. Ballmer hangs about on stage, hands on hips watching close up, or looking around (below). What’s with that? Then he invites his colleague to walk across the stage for another demo, which invokes the classic comedy routine, “Walk this way“, (below). 6. Finally, within a few minutes of opening his Keynote, Ballmer disempowers himself by giving centre stage to the previously-mentioned Seth Meyers clips (left) which are unfunny and don’t lend itself to a visionary experience to come. When Jobs shows clips they usually feature his own team and how they came to conceive and build an Apple product or service, professionally delivered and not playing for cheap laughs. They excite us about the product, showing us what exists below the simple, shiny surface demonstrating the amount of thought which has gone into the product. You can bet we will see this when Apple unveils its tablet. Rather than a few stingy minutes spent in a poorly conceived demo, we will be left with a sense of awe and desire for the tablet. That feeling may pass in the hours and days that will pass, only to be invoked once more when we pick up the object of our desires in our own hands. Is there a way out for Ballmer, so that we don’t see a re-occurrence of these presentation foibles at future CES conventions? Yes. I’ve just been sent a book by Steve Jobs himself, inspired by what Carmine Gallo wrote about him. It’s a one of only two so far produced (the other one was sent direct to Redmond). Let’s hope that a PDF of it is created, as well as Powerpoint slides given away free embedded in Office 2010 when it’s released in June.